Use this to attach a breastcollar. No ring on your girth or cinch? No problem. Just slip the Zilco Girth Loop over it and attach your breastcollar to the brass ring. The Zilco Girth Loop has a brass ring for attaching the girth to the breastplate to minimize slippage on steep terrain. 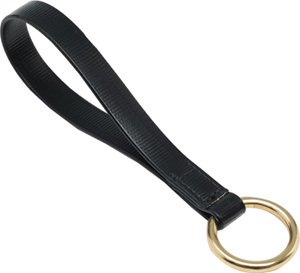 Made of durable, strong biothane this loop comes in black with a large solid brass ring. Biothane is easily cleaned with water. Zilco is a world leader in the design and production of synthetic saddlery products. NOTE: We currently only have this with BRASS, not stainless steel.